A Plainsman review of more than two dozen copies of the Glomerata yearbook found a number of depictions of blackface and racist photos, including one on the page of now-Alabama Gov. Kay Ivey's sorority. A Plainsman review of three decades of Glomerata yearbooks found numerous examples of blackface and racist photos. Warning: This story contains archival images and captions with offensive content. 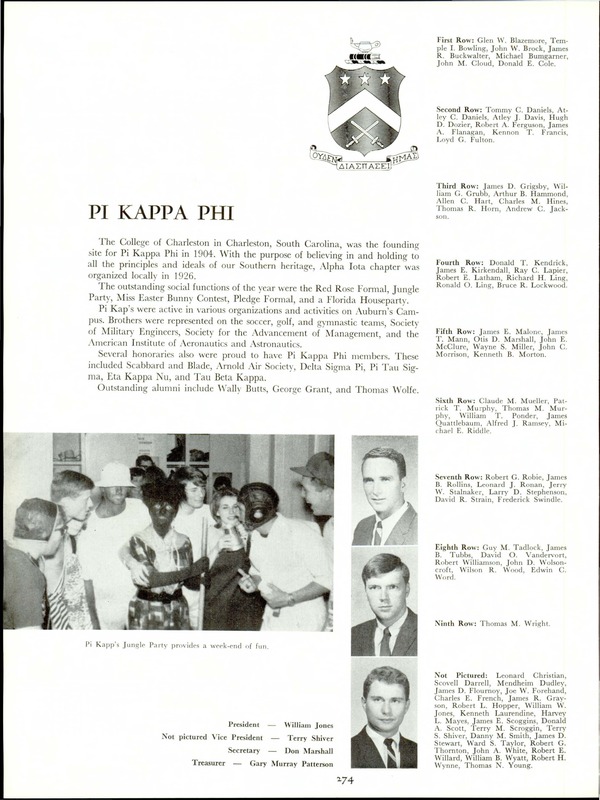 Ivey, who was a senior the year the picture ran on Alpha Gamma Delta's page in 1967, denies knowing about the page, which includes a photo of five young white women wearing black masks and shirts with exaggerated caricatures of black people on the pockets. The photo submitted to the yearbook, apparently taken during a rush event that academic year, is accompanied by a caption that reads, "Alpha Gam Minstrels welcome rushees aboard their showboat." The women in the photo are not identified on the page. This picture ran on Alpha Gamma Delta's page in 1967. It includes a photo of five young white women wearing black masks and shirts with exaggerated caricatures of black people on the pockets. The photos take on interest amid heightened attention to blackface, minstrelsy, KKK regalia and nooses in university yearbooks as Virginia Gov. Ralph Northam faces calls for his resignation after a racist photo on his 1984 medical school yearbook page surfaced. Ivey's spokesman said she had never seen the Alpha Gamma Delta page from her senior year until Saturday morning when The Plainsman contacted her office for comment on this story. “We talked to the governor this morning," Ivey's press secretary Daniel Sparkman said. "She knows nothing about the page in the first place, and she does not appear on that page." Ivey is mentioned for her role as SGA vice president in the write-up about the sorority on the same page, and she appears in the composite on the other page of the sorority's spread. The governor was president of her pledge class in 1964, but her spokesman said she took on less responsibility in the sorority as her involvement in other campus organizations picked up. The governor had nothing to say about the sorority's page or its contents. “Other than that we know nothing about it,” Sparkman said. Photos of students in blackface, performing minstrel shows and other racist images appear often in archived copies of Auburn University's official yearbook. The Plainsman's review of more than 20 Glomerata copies found photos of blackface as late as 1980. Minstrel shows — comedic performances by white people in exaggerated black makeup, masks or other types of blackface — appeared in a number of photos submitted by Greek organizations throughout the 1960s, '70s and '80s. 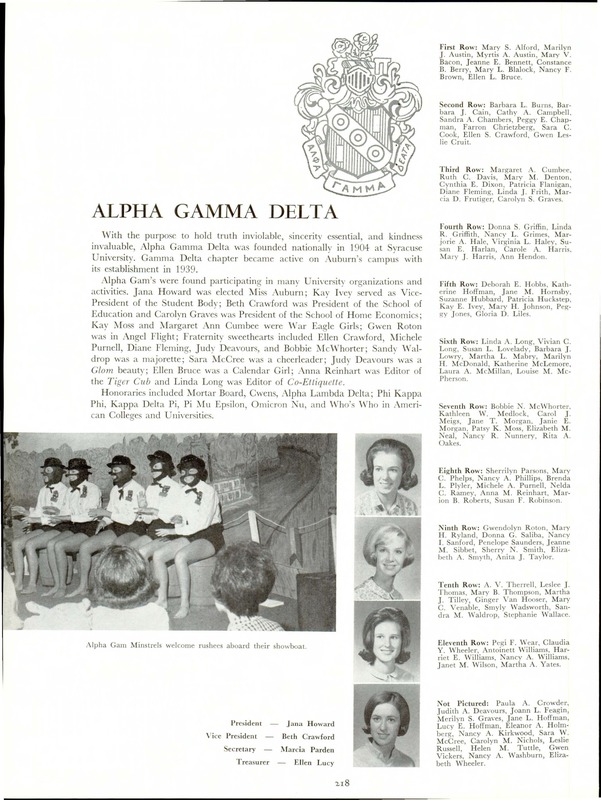 Like Alpha Gamma Delta, other sororities performed minstrel shows, including Auburn’s Gamma Phi Beta chapter shown in the 1969 issue of the Glomerata. 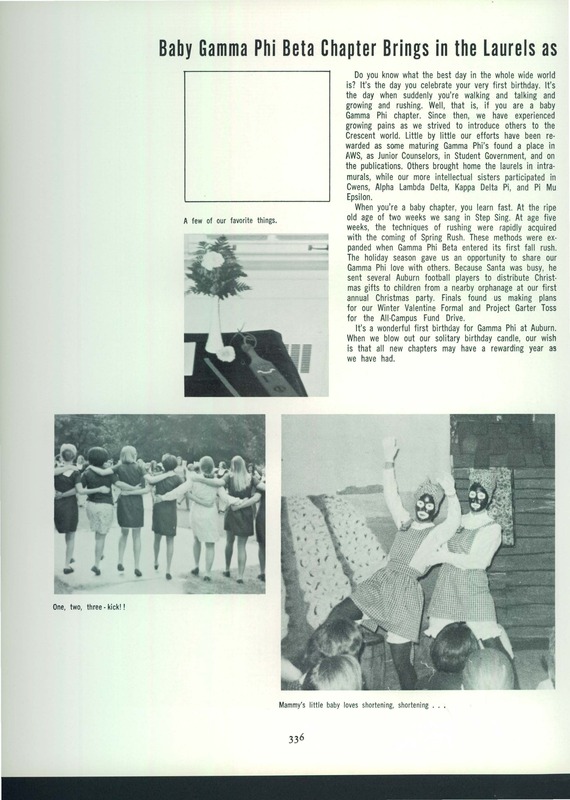 A photo in the 1969 issue on Gamma Phi Beta's page shows two members of the sorority dressed in blackface performing for an audience. Mammy, a common stereotype of black women who did domestic work for white families, was often a staple of minstrel shows. Austin McCoy, assistant professor of history at Auburn, said minstrel shows were not uncommon in all-white groups even as the performances, once popular in the 1800s, lost appeal throughout the 20th century and especially after the Civil Rights Movement. "Folks who are participating start to do so in an underground setting," McCoy said. "It's not out in the open. It's not in popular culture as much. It's mostly limited to a lot of all-white frats, all-white communities and all-white settings that continue this practice. They're doing so not knowing that eventually imagery or evidence of this is going to come out." Public debate about the racist nature of blackface and minstrelsy is not new, though, he said. Public criticism of blackface and minstrelsy dates back to at least the 1910s, when "The Birth of a Nation" was released in 1915. The film was highly controversial, even in that period, for its portrayal of black men — many of whom were played by white actors in blackface — as sexually aggressive and unintelligent. "Someone who does this is really trying to embody racist stereotypes of black people," McCoy said. "Participating in minstrel shows for many white folks who donned blackface was about making black folks not seem real and therefore making it easier for other white Americans to discriminate or even inflict violence against black people. So when people participate in this, they can't separate their participating in it in the present day from the racist past of minstrelsy and blackface. There is no separating the two." 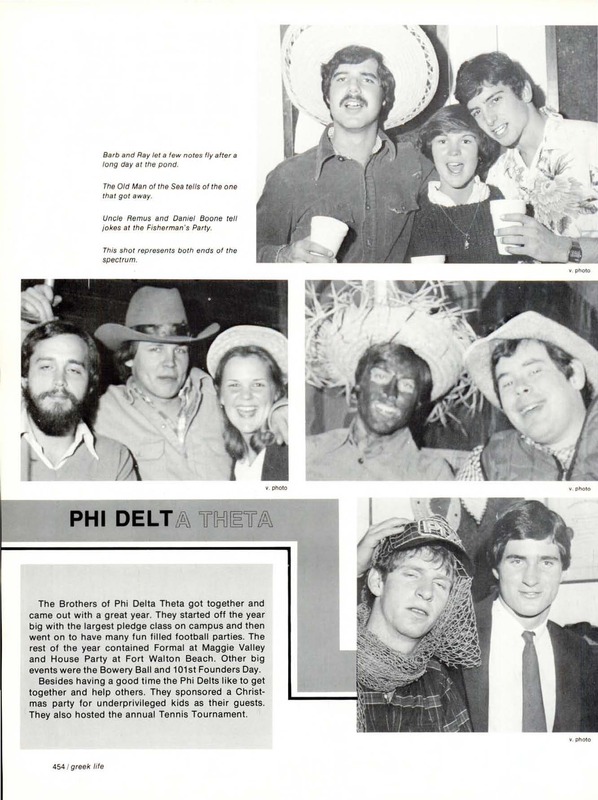 Phi Delta Theta's 1980 page in the Glomerata shows a student donned in blackface wearing a straw hat. 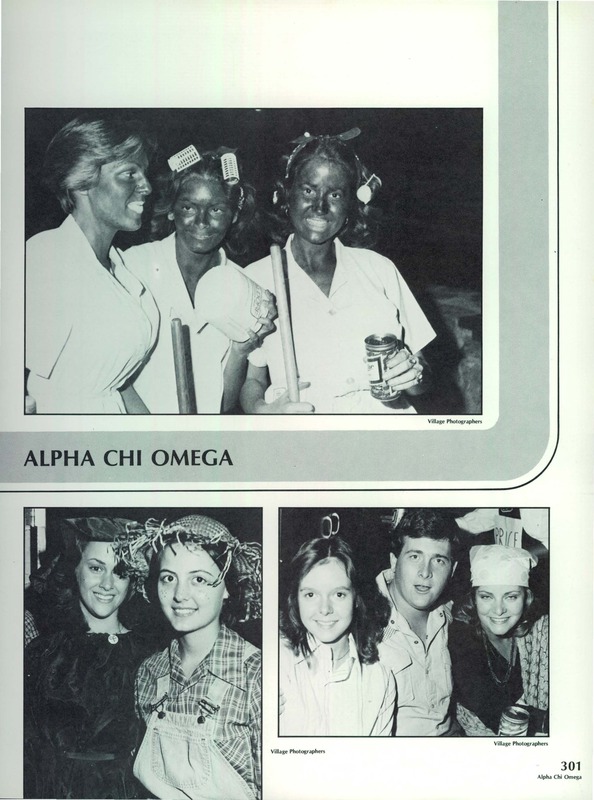 Examples of blackface were found as recently as 1980 on Phi Delta Theta's yearbook page. A photo shows a student donned in blackface wearing a straw hat. The caption of the photo reads, "Uncle Remus and Daniel Boone tell jokes at the Fisherman's Party." But blackface wasn't the only type of racist imagery submitted to the Glomerata. A photo on Delta Sigma Phi’s page in 1970 shows the fraternity chapter with a fraternity brother wearing overalls and posing in a noose held by a fellow member of the fraternity, who is also holding a shotgun in his right hand — an apparent allusion to lynching. Unlike most of the pages, the young men in these photos are identified explicitly in that year's issue. The noose also appears within a Glomerata staff diagram of the photo used to identify those in the photo. The above photo shows the Delta Sigma Phi’s 1970 chapter with a fraternity brother wearing overalls and posing in a noose held by a fellow member of the fraternity. The Plainsman found other examples on Alpha Tau Omega and Alpha Chi Omega's pages in 1980 and 1978. Auburn University President Steven Leath responded to this story in a statement to The Plainsman. Auburn's yearbook is not the only university annual that includes racist photos. A number of schools, particularly schools in the South, are reviewing their yearbooks to gain a better understanding of their history. Students, journalists and academics have uncovered dozens of racist photos since Northam's page was uncovered. The College of William & Mary last week ordered an audit of its yearbooks after officials acknowledged a number of racist photos. University of Maryland President Wallace D. Loh called racist images in the school's old yearbooks "profoundly hurtful and distressing." Northam, a Democrat, is facing calls for his resignation after racist photos surfaced from his 1984 medical school yearbook page. One photo shows two men, one in blackface and another wearing KKK garb. The photos sent that state into political turmoil. Virginia's Democratic attorney general is now under fire for admitting to having worn blackface in the past, and a top Republican there is under fire for serving as editor of a yearbook that included photos of students wearing blackface and holding Confederate flags.